For those who are interested in joining America’s Armed Forces, the ASVAB will be a crucial part of the application and enlistment process. This test is made to gauge your knowledge and abilities in four basic domains: Math, Verbal, Science and Technology, and Spatial. These domains are further broken down into subtests. Your score on this exam will help you and your recruiter determine which academic and occupational placements should be made for you at the time. That way you are fitted with something that you can do well and also learn at the same time. The first step in completing an application for any branch of the military is to meet with a recruiting officer. 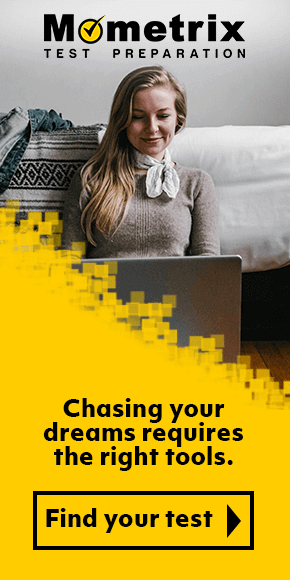 This person will be able to give you a good idea of what the process will entail and what this life choice will mean for you. One of the things they will do to make sure that you can measure up to the high standards of military life is to ask a series of in-depth questions. These are designed to cover your education, health, arrest record, drug use and marital status. Most generally your test will be administered by computer (CAT) at one of 65 Military Entrance Processing Stations or MEPS around the U.S. and Puerto Rico. However, if you do not live close to a MEPS, you may be allowed to test in a Military Entrance Test (MET) satellite location. These are most often found in federal government office buildings, National Guard Armories, and Reserve centers. Some of these may not be able to facilitate CAT exams, therefore, paper and pencil tests will be available. When you arrive to take the ASVAB, make sure that you are on time or early. Late arrivals will not be allowed to test that day and will have to reschedule for another time. You will need to bring a valid government issued form of identification with you. There is no need to bring any other personal belongings with you, as everything you will need to test will be made available to you. This includes a calculator and any electronic devices. 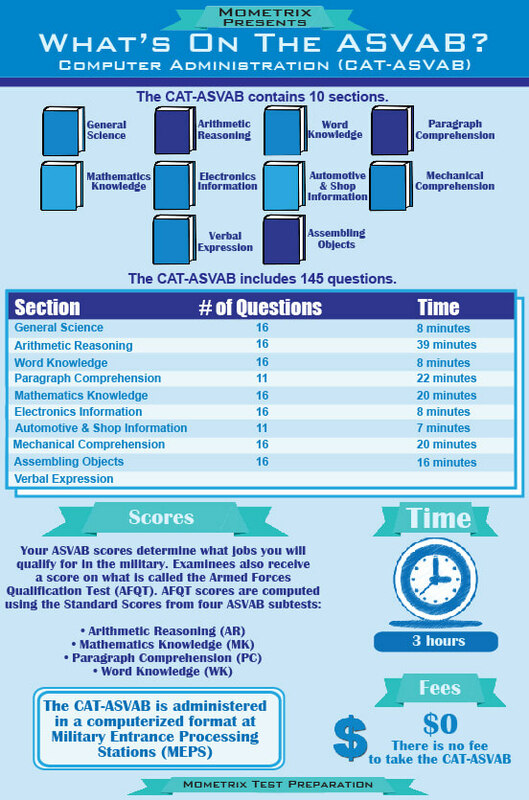 The ASVAB is broken in ten parts. There are 135 scored questions and the possibility to be as many as 15 tryout questions in two to four of the subtests. These questions do not look or sound any different than the scored questions and will be dispersed throughout the section. When you take the exam on a computer you will be given, on average, two hours to finish. If there are tryout questions included in any subtest you will be given extra time to complete those. The Mechanical Comprehension is one of the five subtests that are involved with the science and technology domain. 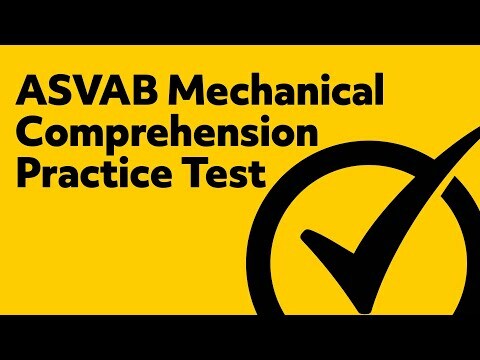 This subtest tests your knowledge of mechanical and physical principles. 40 minutes are given for this subtest if tryout questions are contained. If there are none, you will be given 20. You will be given your test results at the conclusion of your test. If you have taken the test with paper and pencil, your test will be sent to MEPS to be scored. Your recruiter will be notified when your score is calculated and available. We know that you want to do your absolute best of this test to prove you have what it takes. To help you make sure that you pass this test with the best results possible, we have created a study guide and set of flash cards for you. 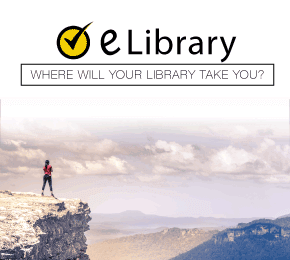 These will allow you to practice and learn the knowledge necessary to ace this exam and all of its subtests. They will also provide you with sample questions showing you exactly what to expert on the day of your schedule exam. Make the most of this opportunity and get both the study guide and the flash cards.